- What is a glass nail file? - How glass nail files are made. - Advantages of glass nail file and reviews. - History of glass nail file. - Difference between glass and crystal nail files. • What is a glass nail file? A glass nail file, also known as crystal nail file – is an ideal nail care tool for your natural or artificial nails, yet is not so common, as other nail care tools. Professionals in beauty salons use glass nail files for manicure and pedicure procedures as well as individuals use glass nail files for their needs in everyday life. Czech glass nail files are not only a nail care tool, but also very practical and original gift for yourself and others. 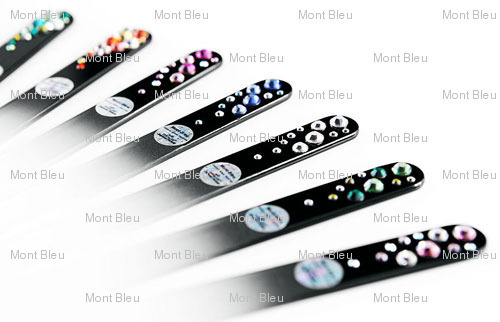 Offering more than 400 types of decoration, including unique decoration with Swarovski crystals, we can satisfy even picky clients who look for luxury crystal nail files. Advertising agencies and corporate clients are widely using our glass nail files as promo nail files. Decorated with company logo, or being used in promotional campaigns or even sold as private label products, glass nail files became an irreplaceable item in its product niche. • How glass nails files are made. Material from which our glass nail files are made of, is Czech glass, and it its harmlessness proven by “Czech Government Health Institute in Prague”. Production process of glass nail files is more complex than described, but those are the basic steps taken to make best glass nail files. 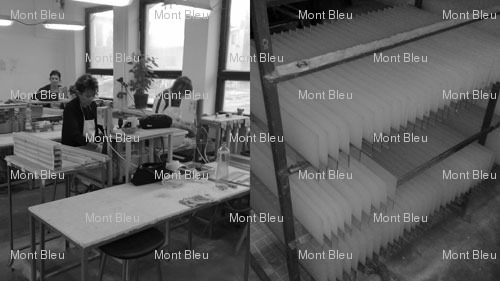 Mont Bleu has been making glass nail files, some can call them crystal nail files, for more than 10 years; talented engineers were improving producing process along all this time. We devote huge attention for the quality of our products, since the producing process mainly hand work, we can control quality on every stage of production, decorating and packaging. All production process takes place in the Czech Republic which is proud of its history and tradition of creating bohemian glass and crystal products. • Advantages of glass nail files. Due to using special technology of glass processing, our glass nail files are favourably comparing with others. Polishing surface has unique, in some places hard, some places soft structure, which prevents nail damaging. It is impossible to reach this surface structure on non-glass nail files. - Functionality; manicure, pedicure, removing of hard skin, gift, souvenir, and promo item: all this is even not full list of how glass nail file could be used. 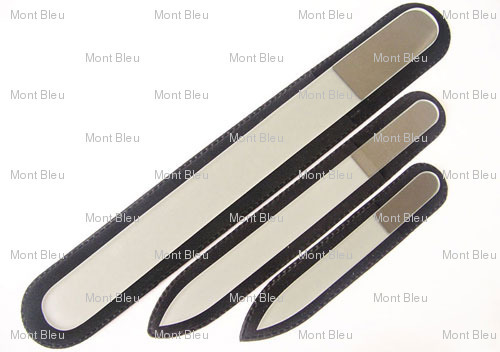 More detailed information about glass nail files features is available on Main Features page. Attention: only original Czech made glass nail file, from tempered glass is the ideal nail care tool that will not harm you. Reviews: many trusted beauty bloggers around the world made their glass nail file reviews, read about them here. • History of the glass nail file. The idea of using glass as a base for nail files were founded and patented more than 50 years ago in Switzerland. Modern process is based on different technologies, and as final result we get high quality product, which has plenty of unique features that made our glass nail file unique. After showdown of production process, many have tried to patent it and some of them succeed. But following trials confirmed invalidity of those patents and, were abolished by court decision. This abolishment, increased market competition, nowadays many companies from several countries present crystal nail file. 1. Engineer who improved producing technology works in Mont Bleu. 2. Only Czech glass is able to guarantee elasticity and firmness at the same time, preventing breakage. • Difference between glass and crystal nail files. To say in few words there is no difference in original glass nail files or crystal nail files in terms of making material or lifelong filling surface. The difference is in marketing the product. You can read more about it in our blog post. To buy our glass nail files for personal use visit our official e-shop.